Pallet Rack Installation Consultation & Computer CAD Drawings & Layouts. Tear Drop Pallet Racks are the most popular type of pallet rack on the market at the moment. It has an clever design that allows you to slide the beams into place without clips or fasteners (Boltless Pallet Racks). Avnix provides many different verities of teardrop pallet rack which allows many arrangement options for warehouses, garages, industrial plants, schools, libraries, storage units, factories and other commercial applications. Warehouse Pallet Racks are typically used for bulk storage in warehouses and industrial factories . Avnix stocks many pallet rack sizes and specialize in used uprights, crossbeams, and wire decking pallet racks. We offer material handling and pallet rack installation in the state of Texas including moving complete pallet rack systems to new destinations. 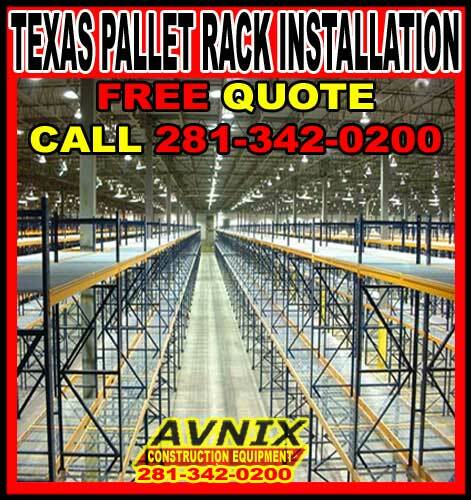 We offer cantilever racks And pallet rack installation in Texas And Louisiana. Many new and used pallet rack sizes and capacities available. Installation of pallet rack sizes to 31″ high, 64″ wide. We can install roll formed and structure pallet racking . Installation of selective, Drive In and Drive Thru pallet racks. Avnix can solve your storage and retrieval needs.